The cost of making mobile phone calls in Europe is set to fall substantially after lawmakers backed plans to cap so-called "roaming" charges. More than 150 million people across Europe will be affected by the changes in the pricing regime. But the new charges are not likely to come into effect until later this year. The changes still need to be approved by the member governments of the 27-nation bloc, although these approvals are considered a formality. A European Commission spokesman described the vote as "wonderful", saying many people would now feel able to use their phones abroad for the first time. But consumers will not feel the benefits of lower prices until late July or early August at the earliest, too late for many people travelling in Europe this summer. Text messaging will not be covered by the proposals. 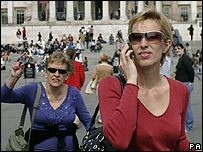 Brussels has sought for some time to regulate the cost of making mobile phone calls when abroad, after finding huge differences in what people have to pay in different countries of the EU. Under the plans, the cost of making a mobile call anywhere in the EU would be capped at 49 euro cents (33p) a minute in year one, while receiving a call would cost 24 cents (16p) at most. These costs should now fall to 46 euro cents (31p) and 22 cents (14.9p) respectively in year two, and 43 cents and 19 cents in year three. British mobile users currently have to pay up to 5.92 euros (£4.03) for a four-minute call made while in Spain. Under the changes, this would fall to 1.96 euros (£1.33). As part of the plans, mobile users would receive a free text message informing them how much they will have to pay when travelling abroad. Members of the European Parliament (MEPs) praised the plans, saying they wanted to focus on consumer priorities. Liberal Democrat MEP Fiona Hall said the new law would protect consumers from "abusive charges" that bore no relation to phone operators' costs. "Mobile phone users should feel the benefits of the single market and not be penalised simply by crossing a border," she said. But she added that "consumers should be warned that texting and data roaming are not covered under this law and charges for these services are still excessive". The Chair of the parliament's Consumer Protection Committee, Arlene McCarthy, welcomed the new law and warned the industry that "consumers will expect continuous and sustained reductions in calling charges". "Just because the law will lapse in three years time, it does not mean that the mobile network providers can return to charging consumers exorbitant costs," she said. Some phone firms have already cut roaming costs in anticipation of the changes. But the industry reacted angrily to the plan, saying that regulators had failed to prove the market was not working properly and the move had been driven by "political expediency". "Mobile phone operators price their services to a broad range of customers," said Tom Philips, from the GSM Association, the industry body. "Our members operate in a highly competitive market." The price caps may mean that smaller firms find it difficult to compete in the future and that domestic call charges could rise as a result, he added.